In general terms, an ejido is a collective group of people that live and work on a determined piece of property as a community. While the concept of the ejido in Mexico is prehispanic, most of the fundamental ideas and concepts that created what an ejido is today stem from the theories of democratic communism. Understanding this is very important when dealing with ejidos. Most people reading this article have grown up in a society based on democratic capitalism in which the individual and not the community determines what he or she is going to do. In a communistic society the community determines what it is going to do, including agreeing upon how the land they hold is to be used. Ejido land near San Felipe. Taking into consideration the above, it is not hard to imagine the confusions that could exist when discussing ownership of ejido land. Most foreigners associate the word “ownership” with terms such as fee simple, private property and Adam Smith, while the ejidatarios idea would be more on the lines of community rights, right to use and enjoy, and governmental concession. Until ejido land is converted to private property, foreigners cannot acquire “ownership” of ejido land in accordance with their understanding of the word “ownership”. 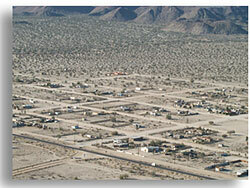 Ejido land cannot be sold to non-ejido members until it is converted into private property. There are exceptions where non-ejido members can acquire “posessionary” rights to ejido land, however the rules governing posessionary rights are not very secure, especially for foreigners. Foreigners cannot legally become ejidatarios. What an ejidatario understands as ownership is often different than your understanding of ownership. CAN EJIDO LAND BE CONVERTED INTO PRIVATE PROPERTY? 1.- By filing a suit based on prescriptive rights (adverse possession). This suit will only be productive when the person wanting to acquire title to ejido land can prove that he or she has possessed the land in good faith for 5 years or in bad faith for 10 years. Many professionals argue that this rule does not apply to foreigners. This article does not focus on converting ejido land into private property in this manner, however it should not be dismissed as a viable option. The legal institutions of prescriptive rights or adverse possession are the methods of acquiring complete ownership rights to property, against the owner and other third parties, through possession of the property for an uninterrupted period of time. This time will be interrupted if the possession of the property is left or if the legal owner or a third party makes legal claims to the land. This method cannot be used if a contract exists between the owner and the person in possession of the property. Under the new Agrarian Law “prescriptive rights” can be used to acquire ownership to property. The “good faith”, 5 year possession rule, in general terms, means that you have to possess the property for 5 years, be recognized locally as the owner, pay your property taxes and not know who the true owner is. The “bad faith” 10 year possession rule, in general terms, means that you have to possess the property for 10 years and you may or may not know who the owner is. PROCEDE or “Program of Certification of Ejido Rights” is a government procedure by means of which the government, upon the approval of the ejido, certifies the agrarian rights to land within the ejido. This is not an obligatory procedure and will only begin when the majority of the ejido agrees to enter into the procedure and the ejido does not have any legal conflicts that prohibit it from entering into the program. Some of the more common types of conflicts that inhibit an ejido from entering PROCEDE include: conflicting ejido boundaries, internal conflicts, pending litigation and determination of actual number of ejido members. Once the ejido has agreed to enter into PROCEDE, the government at no expense to the ejido, will study the documents of the ejido and begin the often time long procedure of surveying the entire ejido. The surveying procedure often takes a long time due to the fact that each individual lot, parcel and common use land needs to be surveyed. These surveys are based on radiolocation points and GPS and the maps are registered with the corresponding governmental agencies. 1.- “Solores” or lots. These are converted to private property through the PROCEDE procedure and do not require the Dominio Pleno procedure to be converted into private property titles. 2.- “Parcelas” or parcels. Through PROCEDE parcels are given certificados parcelarios or parcel certificates and which are governed by agrarian or ejido law until converted to private property titles through the Dominio Pleno procedure. 3.- “Uso Comun” or common use land. Common use land cannot be converted directly into private property titles but can be converted into either Solares or Parcels. As soon as the government has issued the majority of the ejido titles or certificates the second procedure which is called Dominio Pleno can begin and by means of which each individual ejidatario can convert his parcel certificate into a private property title. The Dominion Pleno procedure is much less involved than the PROCEDE procedure. Once the ejido legally can enter into Dominio Pleno, an ejido meeting has to be called and the members of the ejido have to agree that each individual ejido member can, from the date of the agreement, convert their parcel certificates into private property. This does not mean that from this moment on all the land in the ejido is now private property. The only thing that the approval of Dominio Pleno means is that each individual ejido member, whenever he or she feels it is convenient, can convert his or her parcel certificate into a private property title. Once the parcel certificate is converted to a private property title and dully registered, the ejido member can sell to persons outside of the ejido, including foreigners, observing certain third party legal rights. Please understand, even though the Dominio Pleno procedure is much less involved than the PROCEDE procedure, there are many formalities that must be observed. If these formalities are not observed the transfer of the corresponding property title could be declared null and void. The fact that vast tracts of ejido land can now be converted into private property, coupled with the fact that recent reforms in Mexican legislation now allow foreigners to secure title to land much easier, add up to huge investment possibilities for people looking for security through real estate investment with the probability of large returns. Please contact me if you have any questions regarding the above or are interested in acquiring ejido property.